Home // Events // Public // Fort Myers Beach Fourth of July 2018: Fireworks, Parade & More! Fort Myers Beach Fourth of July 2018: Fireworks, Parade & More! This information is for 2018. Please check back on our website for information on confirmed 2019 Fourth of July Activities closer to the event. 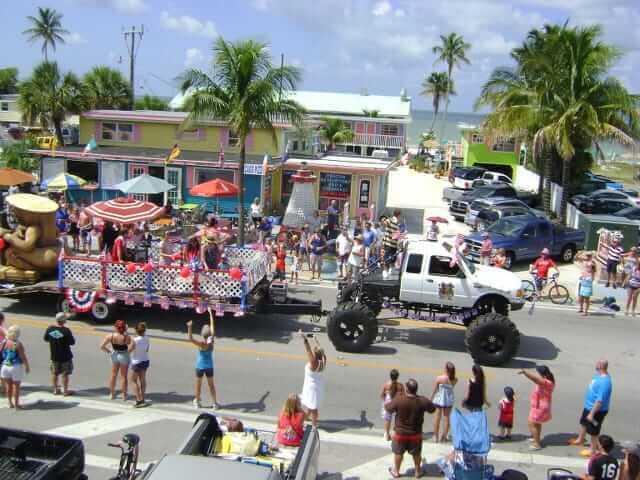 Come celebrate our great nation and town pride as the Fort Myers Beach Fourth of July parade makes it way down Estero Blvd. with its colorful floats and costumed participants! The parade starts at Bay Oaks Recreation Center at 10 a.m. and continues down the boulevard to Times Square. 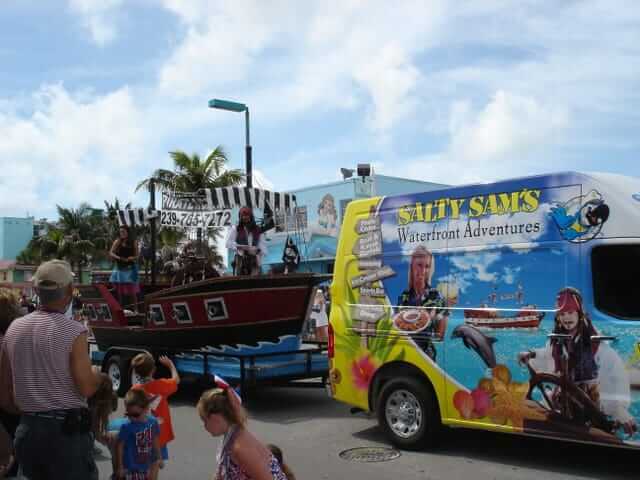 Don’t miss this Fort Myers Beach tradition! Be aware the Matanzas Pass Bridge will be closed from 9 a.m. until Noon for the Fort Myers Beach Fourth of July Parade. Join the Parks & Recreation Department in Times Square from 12 p.m. to 2 p.m. for the Patriotic Event! Activities include patriotic crafts, a watermelon eating contest and a dunk tank. This event is always held the Saturday before the Fourth of July. The Fort Myers Beach Fourth of July fireworks show begins at approximately 8:45pm at Times Square. You can bring a beach chair and and enjoy the show as the beautiful fireworks light up the night sky! Closing time for the Matanzas Pass bridge is 9:30pm-11pm to oncoming traffic. So during that time you can get off the island but not on. There are plenty of great restaurants where you can eat and drink throughout the day. Click here for information on Happy Hours and check out our live music page to see who has entertainment. You might also enjoy taking a boat cruise to enjoy the local wildlife or you may want to visit one of our local parks. Consider taking the Beach Trolley to Fort Myers Beach to enjoy a full Independence Day of activities! Please click here for more information on the trolley. See below for information on extended trolley service for the 4th. Paid parking lots are located at Lynn Hall Park, on Old San Carlos Blvd., under the Matanzas Pass Bridge, and across & next to the Lani Kai Resort. Please click here for more information on parking.